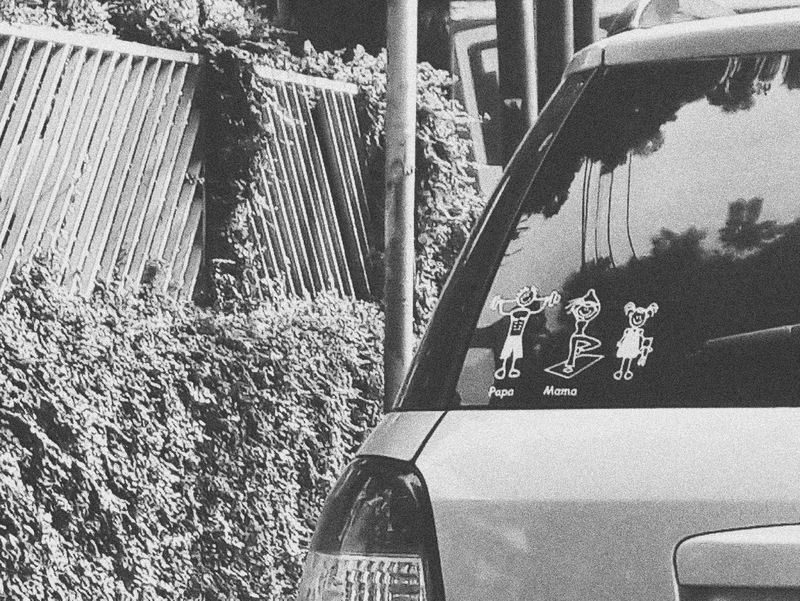 There is perhaps one thing more detestable than a typical reckless driver in this city’s rush hour traffic: the “happy family” rear window sticker. If you have never seen one, you have probably never left your house because these stickers are everywhere. Mom, Dad, First Child, Second Child, Baby, Cat. Those with an ambition to present themselves as more than just another generic middle class family even add each member’s nickname. A white apple or a sign of allegiance to a particular religion or community is no longer prestigious. The family is today’s trendiest brand, made visible by the logo of the happy family. A child is a gift from God, or so the saying goes. Having one is a blessing. Having three is a blessing multiplied by three. In a culture where brags often masquerade as humble gratitude, blessings of all kinds need to be announced. Yet this public display of familial intimacy ironically amplifies its exclusivity. This is my family. My family is special. These are our names. Know us. Remember us. But you cannot be a part of us. Where does the eagerness to unveil our families for the world to see come from? Do society’s high expectations of this perceived sacred institution oppress us so effectively that we try to convince ourselves we are perfectly happy with the family we “have”? If we were to play along with the idea that a family is something that one is able to have in the same manner that one has a smartphone or a comb—in other words, something to own—then the family is no longer seen as a group of living, breathing human beings. The family becomes a thing. At best, it turns into a product to be advertised; at worst, it becomes another image to be desired yet impossible to truly obtain. Nowhere is this oddly inverted metamorphosis more visible than on social media. There is at least one parent who just cannot seem to stop sharing photos of his or her precious child. Some even go as far as to set up an account on behalf of the poor, oblivious infant who most likely does not even know her or his own name yet. “Show, don’t tell,” used to carry some weight. Now, it is eerily the only fitting slogan for our sleepless society. The family, at least as far as this society is concerned, has a large impact on the status and identity of both men and women. A man is not a man until he has a wife and preferably several miniature versions of himself. A woman is not a woman until she is able to bear miniature versions of her husband. Resistance is slow and suppressed. Even the strong-willed can crumble under pressure. The logo is under the spotlight once again. Uncontested. Celebrated. The father takes pleasure and pride in his role as the main breadwinner. The mother accepts that her husband and children are her only sources of pride. The children are possessions. We cannot escape the distorted image of the family that continues to appear among countless images of children in various stages of growth. It is owned but it is elsewhere, like a memory that can never be retrieved. Unconditional love, one of the central components of the myth of the family, is crucial because the concept is alluring. It suggests that one is able to get away with anything while still being accepted, protected and loved by a group of people. It also implies that one is entitled to loyalty without making even the tiniest contribution to the group as a whole. Sentimentality and selfishness are a crude yet highly productive couple. The two end up producing much more than they have to, and we find most of that excess in the modern workplace. Employers exploit the family narrative by borrowing the values and roles of the family in order to control their employees without looking like they do, in fact, exert all the power. Employees are made to believe that they are truly at home, at work. Going on office trips, being on a first-name basis with superiors, engaging in silly office chat groups are strategies to make the workplace feel less like one. The fact that one is a mere foot soldier magically disappears. Such is the tragic nature of the urban workplace. The ultimate tragedy occurs, however, when the employees get home and have to do it all over again. The family lives on. But why does it live on? In The Anti-social Family, Michèle Barrett and Mary McIntosh write: “We live in a society where the ‘average family’ is continually evoked. We are continually addressed as belonging to it, by the left and the labour movement as much as from any other source.” Their criticism is specifically aimed at men, who have been more dominant across the political spectrum. The male pride that stems from being responsible for (and therefore in charge of) the family reveals patriarchy’s ambidexterity. But to simply turn the tables would not solve the existing problem of the family. If women, gay men, transgender people, etc. were to seize the throne of the traditional head of the family, we would only manage to change the features of the family image instead of changing the family itself. Getting a new face for an old problem will not eliminate the problem. Despite the many weaknesses of the family, it is impossible to deny its ability to evoke powerful feelings of solidarity. This is certainly one element that can be used to create a more inclusive unit of society. Concepts of exclusive membership and blind loyalty only sustain the family’s suffocating patterns. Loyalty cannot be inherited. Nobody owes anybody love. We have to learn to see the “idealized family” for what it is: an illusion. If we do not start to challenge our own assumptions about the structure and function of the family, we will never grasp the many aspects of society it has successfully penetrated. Focusing on its physical features alone would only lead to the creation of variations of the current problem. Societies, like trends, are not immune to change. And since families make up societies, they too, can change and be changed. *The first version of this piece was published as “Scribbles #2: Confronting the Family” in Construct #12 under a pen name.